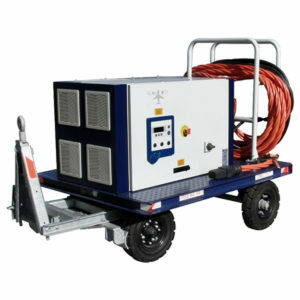 Our RBC8000/28M Mobile Ground Power Units deliver an output of 200V 3 phase 400 Hz and 28V DC to the aircraft through a SINGLE or DUAL OUTPUT contactor and can be connected to a standard 380V to 415V 3 phase 50Hz mains or other. The RBC8000/28M Mobile GPUs can support AC and DC power output simultaneously as long as the total load power does not exceed the power of the unit. RBC8000/28M Mobile – Ground Power Units use High frequency IGBT Technology (Rectifier and inverter) to guarantee a sinewave input with low THDi (THD‹1.5%) and unit power factor (PF=1), perfect for civil airports and military applications as we guarantee a minimum impact on the mains or other power sources upstream. The RBC8000’s highly reliable, very efficient and easy to operate and maintain. Our GPU (Ground Power Units) use double conversion technology with an integrated inverter output transformer to ensure galvanic isolation of the load. The Red Box RBC8000/28M units come supplied as standard with a 10m Input cable and a 10m output cable, with control and signalling wires and aircraft connector. Other cable lengths are available on request. Are combination units come with either of the following 28V DC options; 300A continuous and 1200A peak or 600A continuous and 2400A peak.